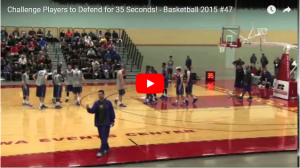 This defensive drill is demonstrated by Northern Iowa Head Coach Ben Jacobson and the Northern Iowa players. He has his team execute for 35 seconds since that was the college rule at the time that this video was filmed. You can set the time length for anything that challenges your players. When I have used this drill, we have used it as a toughener drill to end practice with and set the time at 51 seconds. I selected that time because one season, our average time in the half court portion of our defense was 17 seconds and I wanted our players to prove that they were more than tough enough to make a stop at the end of a game because they had done 51 seconds in practice. Also, since we practice against our high school second unit, I wanted it to offer more of a challenge than the younger players could. In college, you probably practice against a better second unit. My focus for the drill is execution, and not just results. We do not start over if the other team made a shot as long as it was challenged and we had all of our block outs completed correctly. We also started the 51 seconds over if the defense was not talking or not in proper help positions. You can add anything to the defensive violations list that you emphasize. One idea you might consider adding to the drill would be conversion defense, rather than just running the drill half court. You don’t have to stop to huddle each time the clock stops. Use his ideas as a guide to set the drill up as you want to. The video is a You Tube video so make sure that you are on a server that allows You Tube access.